Overuse and strain injuries are most common. An overuse injury results from excessive wear and tear on the body, especially in areas subject to repeated activity. Ankle, knee, shoulder and elbow joints are most prone to overuse injuries. A strain injury is where fibers in a muscle or tendon tear as a result of over-stretching. Many sports injuries can be avoided by suitable conditioning and sufficient warm-up and cool-down before and after. In this section, we look at some injuries pertinent to common sports. In all cases, physiotherapy can help. Avid athletic professionals as well as amateurs may encounter debilitating pain and injuries from over-training, rough competition or plain accidental damages. Athletic injury is common to all athletes and can happen at any time without warning. Athletics injuries can even occur without notice, even up to few days later and may affect your performance until you have fully recovered. With physiotherapy treatment at Platinum Physiotherapy, you can resume training and get back in the game quicker. The benefits of rehabilitation and recuperation through physiotherapy are well worth looking into. Sports and other athletic injuries usually occur when athletes are not careful during their sport of choice. In the event of an athletics injury, first aid may only be the first step in recovery. Causes of and symptoms such as sprains, muscle aches, overworked tendons or ligaments and other muscular damage can be treated efficiently with physiotherapy. Physiotherapy sessions will focus on special exercise and manual therapy treatments as well as recovery plans and workout schedules to provide relief from pains. Whether you are a professional or an amateur athlete, we can plan and provide proper care you need to get out and do what you love doing. As physiotherapists, we often stress to patients that athletics injury occurs when carelessness and other factors come in to play with their sport. Wearing proper sports attire and wearing it correctly can help to prevent such injuries. Excessive amounts of stress can hold you back from your full potential. This extra stress can cause aches, pains, discomfort and even the inability to think while exercising. This is when an athlete is in greatest danger of hurting themselves and others by accidental causes. In the event that you are harmed or feel pain after sporting activities, you should visit us for evaluation and to discuss how we can serve you to solve your problems and get you on the right track to recovery. 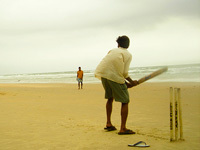 The player most prone to knee injuries is a bowler. In a single cricket season, as many as 60% of the bowlers will suffer a knee injury. One common injury that happens to bowler is a torn meniscus, ACL or Collateral Ligaments. The symptoms are pain, swelling, stiffness and weakness. Players need physiotherapy treatment and a mix of ice packs, knee brace or action knee strap. Batters and bowlers are prone to shoulder injuries, which include dislocated shoulder, frozen shoulder and a shoulder separation. The symptoms of such injuries include pain, swelling, stiffness and weakness. To work through these symptoms, players will need physiotherapy treatment and hot/cold therapy packs. The most common player to receive lower back pain is a bowler. The back pain occurs mainly in younger, faster bowlers as they have more mobility than their older counterparts. Back injuries could be anything from a herniated disc, back strain or spondylolysis. The symptoms of such injuries include pain, stiffness and weakness. Treatment involves a strengthening and stabilizing exercise program with manual therapy..
Every part of the body in fact is prone to injury for cricket players. The best way to avoid an injury through is by warming up properly before any game. Today’s Cricketers are actually becoming more fit and able to stave unwanted injuries which keep them out of a game. A typical warm up should increase blood flow and oxygen to muscles and range of motion of joints reducing the risk of tearing the muscles. Once off the field, keep your muscles warm by putting on a warm up outfit too. To avoid any injury on the field, make sure you wear the proper gear, such as a mouth guard, proper headgear, shoes and protective pads. Keeping the field free from stones or water is important. Remember, if you are a cricket player in need of rehabilitation, muscle strengthening, or have sustained an injury, come in and visit us at Platinum Physiotherapy to discuss how we can help you. The joy of cycling comes from a love of fresh air, good exercise and enjoyment of the sights along the road. Unfortunately, after a cycling injury the pleasure of getting on a bike and enjoying the freedom of the ride is overtaken by pain and discomfort. The good news is that latest sports injury healing techniques are designed to quickly identify the type of injury and apply the appropriate treatment. Many cyclists experience leg cramps after spending long hours on a bicycle. The muscles repeatedly pump and contract, causing stiffness and an aching feeling. If the condition is chronic and hinders the ability to enjoy a ride, physiotherapy can bring relief and help avoid reoccurance. Some cycling injuries occur as the result of climbing steep elevations. In some cases this can be prevented by ensuring that appropriate gears are selected and that the bike is suited for elevated terrain. You should check the seat height and handlebar levels are suitable. But even with the proper equipment, warm up and stretching routines, injuries may still occur. The knee area receives stress from weight bearing pressure and could sustain significant injury. Some of the most serious cycling injuries involve trauma to the back and spinal cord. Particularly on a long ride, a cyclist may be hunched over the handlebars for long periods of time. Add this to a sudden bump in the road and the entire back region experiences a jolt. Good posture may help prevent some of the strain but physiotherapy is the best cure for back injuries. In many cycling injuries, back and spinal cord problems are some of the most painful and chronic conditions. Warming up before a ride and taking precautions to not over-stress the body are important practices to prevent injuries. But if an injury occurs, the professional staff at Platinum Physiotherapy have the expertise, knowledge and equipment to treat cycling injuries. We start by identifying the specific injury and advise you about the optimum treatment, discussing all options and the length of time required for successful rehabilitation. The aim is to quickly get you back on your bike and return to the road. Athletes who participate in endurance sports are subject to injuries different from those suffered by other athletes. Most of these endurance sports injuries are the direct result of pushing the body to its limits over a long period of time. For example, shin splints and various forms of tendonitis are common among long-distance runners and triathletes, while rotator cuff injuries are common with rowers. When an athlete participates in an endurance sport, the continual, intense strain on the body almost inevitably leads to injury. To reduce such injuries, endurance athletes should undergo extensive training to ensure they’re using their bodies correctly and to build the necessary strength and endurance to stand up to the intensity of long-term physical exertion. Warming up is important to prepare the body by loosening tight muscles and lowering the risk of strain and tearing. In general, the best way to treat endurance injuries is prevention. Injuries of this kind are most often caused when the athlete pushes himself too far or too hard after insufficient training or warm-up. Even when pushing endurance to its limits with this kind of extreme sport, it’s important to treat the body properly. Physiotherapy for endurance sports injuries can take a variety of approaches, including stretching regimens, weightlifting, application of heat and cold, manual therapy and other techniques to help rebuild and strengthen injured muscles. At Platinum Physiotherapy, our skilled and experienced physiotherapists can help you recover from endurance sports injuries and continue in your chosen sport. The ACL is an important ligament as it helps to stabilise the knee. 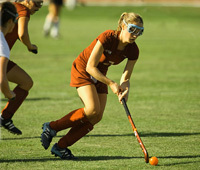 ACL ruptures are common field hockey injuries, especially in women and can occur when the knee is twisted during a change in direction. This type of injury causes knee pain, swelling, instability and difficulty walking. A loud pop may be heard at the time of injury. If this happens you should stop play immediately, apply the RICE formula (Rest, Ice, Compression and Elevation) and seek medical attention as soon as possible. Rehabilitation with physiotherapy is always needed to help return to the hockey field. The menisci are made up of two rings of cartilage – the medial meniscus and the lateral meniscus. Their function is to absorb shock in the knee. Constant twisting of the knee can cause pain, swelling, difficulty bearing weight and inability to bend the knee. When this happens you should stop play and apply the RICE formula as above. Physiotherapy will be needed to help you return to future games, but in severe cases surgery may be necessary, followed by rehabilitation. This is a very common field hockey injury which occurs when the ankle turns over causing the sole of the foot to turn inward. Damage is usually to the ligaments on the outside of the ankle. Symptoms are ankle pain, swelling, stiffness, bruising and an inability to bear weight. Using the RICE formula followed by physiotherapy, is the best form of treatment. Sudden, sharp pain at the back of the leg while sprinting or quickly changing direction can signal a hamstring strain. Other symptoms are pain while stretching the muscle, swelling and bruising. There are different grades of hamstring strains, with symptoms ranging from mild to severe. In severe cases, walking is greatly limited and crutches may be needed. Treatment consists of the RICE formula followed by physiotherapy. A tear or rupture to any of the muscles on the inner side of the thigh constitutes a groin strain. This type of field hockey injury results in groin pain, ranging from mild to severe, grade 1 being mild, 2 moderate and 3 severe. Tightness may be felt in the groin area as well as pain when squeezing the legs together. In a grade 3 strain, a lump or a gap in the muscle may be felt. Rest and ice along with physiotherapy are needed to help you return to the field. 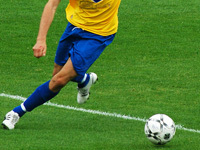 Knee pain, swelling and tenderness on the inner side of the knee are the usual symptoms of this common soccer injury. There may also be difficulty walking or straightening the knee. The athlete needs to stop all activity when this happens and apply ice to the knee. Taping and elevating will help to reduce swelling. ACL tears always require surgery and physiotherapy to restore function, range of motion and strength. The athlete may have to wear a brace to stabilise the knee following surgery. This can occur from a sudden blow to the head during a fall or during play. Concussions may be mild or severe and symptoms may range from confusion to loss of consciousness. In every instance, medical attention should be sought as even mild concussions can have serious consequences later on. This is a common football injury and can range from minor strains to serious rupture of the hamstring muscle. It is characterised by sudden, sharp pain at the back of the thigh that may disrupt your movement. Straightening the leg all the way will also be difficult. This type of football injury can be avoided by warming up properly before play and by keeping the leg muscles strong and flexible. If you do suffer a hamstring injury, you need to rest the leg and apply ice until the swelling subsides. A physiotherapist can help you stretch and strengthen your muscles to decrease recovery time, improve performance and prevent injury. This term refers to pain under and around the kneecap and is also called Runner’s knee. Because the patella can move in different directions, inadequate muscle strength, overuse or improper balance can affect the patella and cause knee pain. A player suffering from this type of pain needs to rest from soccer and do some type of low-impact sport such as swimming. A proper rehabilitation program is necessary to stretch and strengthen the muscles surrounding the knee and help prevent re-injury. This is a type of football injury that manifests itself in generalised pain along the inside of the shin bone. Shin pain can be caused by trauma, repeated stress on the leg as a result of over-training or excessive running on hard surfaces. Beginners are prone to this type of football injury as their muscles, bones and joints are used to the effects of high-impact sports. Proper warm-up and cool down are important to preventing this type of injury, as well as stretching and strengthening of the calf muscles. Also, if you over-pronate in your feet, you may be advised by your physiotherapist to wear orthotic lifts in your shoes. Resting from football and getting yourself under the care of a capable physiotherapist are the best steps you can take to correct this problem. For these and other types of football injuries, please come in and see us, or give us a call. These may result from a sudden force applied to the ligaments of the lower back due to poor swing mechanics. Poor conditioning of the body, lack of flexibility and repetitive strain can lead to injury and low back pain. An injury of this type can be treated with restricted and light activity including stretching and strengthening exercises. Your physiotherapist can perform a proper assessment, then set up an individual program designed especially for you to help you return to golf. Not only will your body be less likely to break down, but will also have increased efficiency improving your game. The rotator cuff consists of a group of muscles and their tendons that help to stabilise the shoulder and allow arm movements. A torn rotator cuff is a severe golf injury and can seriously limit shoulder movement and strength. Other symptoms are shoulder pain, which is worse at night, and weakness in the shoulder. Raising the arm overhead becomes difficult. A torn rotator cuff potentially requires surgery, followed by rehabilitation. These are golf injuries that may result from overuse. Tendonitis is inflammation of a tendon; bursitis is inflammation of the bursa – the fluid-filled sacs between the tendon and skin or tendon and bone. Tendonitis can lead to impingement syndrome as the muscles and tendons become inflamed and swollen. Repetitive overhead arm motions may irritate the muscles, tendons and tissues over time leading to inflammation and impingement. Symptoms of this condition are slow onset of pain, and shoulder or upper arm pain at night when lying on the affected side. Pain may also be felt with abduction of the arm (moving the arm out to the side) or raising the arm overhead. Shoulder pain at the front or the side is also common and may radiate down to the elbow and forearm. Treatment involves rest, icing and the use of anti-inflammatory medications. Physiotherapy is needed to help return to golf. This is an overuse injury often experienced by golfers as a result of small tears occurring in the tendons of the forearm. Elbow pain occurs on the inside of the elbow as opposed to tennis elbow where pain occurs on the outside. Pain increases when flexing the wrist and when grasping objects. Treatment should begin with the RICE method to decrease pain, swelling and inflammation. Your physiotherapist will prescribe exercises to stretch and strengthen the flexor muscles, manual therapy will also be used to break down any scar tissue. A wrist splint may also prove helpful. Recurrence of this injury is quite common, therefore you may be advised not to return to golf too quickly. Many golf injuries can be avoided with proper conditioning, warm-up and cool down before and after the game. 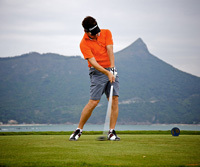 If you have suffered any type of golf injury or think you may lack conditioning, come in and see us for an assessment. We can help improve your body increasing your efficiency and lessen the likelihood of injury. Inherent close contact puts these among the most common martial arts injuries. First aid treatment consists of ice and bandaging depending on the nature of the bruise or cut. Injury to ligaments and muscles can occur from over-stretching of the ligaments or tears to the muscle and tendons. Legs and the cervical spine are most affected, with men having a higher incidence than women. Rest, ice, compression and elevation (RICE) are helpful in relieving these conditions, followed by physiotherapy. Knee injuries can result from forceful kicking and sudden changes in direction with the knee bent. Karate, judo and Thai kick boxers are all prone to this type of injury. ACL (anterior cruciate ligament) injuries are quite common for the reasons mentioned. An ACL injury causes sharp knee pain, swelling and difficulty bearing weight. RICE can be used to decrease pain and swelling, but you should get to your physiotherapist quickly as possible for an assessment. Surgery may be required in some cases. These are quite common in most martial arts, especially where grappling or throwing is involved. Fractures to the fingers and toes as well as the long bones of the forearm and legs are common. Dislocations to the shoulders, fingers and toes may also be sustained. RICE, medical attention and physiotherapy are vital to enable you to return to martial arts. These occur in martial arts where lifting and twisting, and falling is involved (e.g. throwing in judo). Back pain, decreased movement and stiffness are some of the symptoms. Rest and ice are helpful, but it is important to see your physiotherapist in order to rule out any other form of injury. Physiotherapy is needed for pain management and to improve flexibility and strength. These are life-threatening and encompass a wide array of injuries such as thoracic trauma, stomach trauma involving internal organs, spinal cord injury, cervical neck injury (whiplash), testicular injury, head injuries resulting in neurological damage, and many more. These all require immediate medical attention, and in some instances the player may not be able to return to martial arts. Participating in Martial arts is a great way to keep fit, improve concentration and discipline while at the same time learning how to defend oneself and others. However, it can be dangerous and demanding. In order to stave off the risk of injury, it is wise to constantly improve flexibility, strength and endurance. Physiotherapy can help you do this, and if you do become injured, see us first. These represent a high percentage of rugby injuries and can be easily treated with ice and bandaging. These can result from sudden force applied to the ligaments during tackle. Poor conditioning, lack of flexibility and overuse can lead to muscle pain. An injury of this type can be treated with rest and light activity including stretching and strengthening exercises. Your physiotherapist can perform a proper assessment, then set up a program designed especially for you to help you return to rugby. 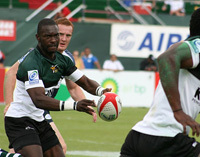 Fractures, usually of the clavicle (collar bone), are quite common among rugby players. Falling onto an outstretched arm or coming into contact with another player can lead to this type of fracture. There is extreme pain in the clavicle, swelling and a bony deformity. This injury calls for immediate medical attention. The bone may have to be immobilised in a sling or bandage. In some cases surgery may be needed. Physiotherapy is needed once the bone has healed. The menisci are bands of cartilage that act as shock absorbers to the knee and help distribute weight evenly between the tibia (shinbone) and the femur (thighbone). During tackles the medial meniscus is more likely to be injured as forces are impacted from the outside of the knee. Twisting of the knee may also lead to a meniscal tear. Symptoms are knee pain on the inner surface of the joint. Swelling usually occurs within a day or two of the injury and it may be difficult to bend the knee fully or bear weight. The athlete should stop play and use the RICE formula (Rest, Ice, Compression, Elevation). Consulting with a physiotherapist is necessary to set up a rehabilitation program to help you return to rugby. This type of knee injury occurs through a twisting force when the foot is firmly planted on the ground, or it can occur as a result of direct trauma during rugby tackle. There may be an audible pop at the time of the injury, followed by knee pain, swelling and tenderness on the inner side of the knee. It may be difficult to walk or straighten the knee. With this type of knee injury, the athlete should stop the activity immediately and apply the RICE protocol. Surgery is almost always needed. Physiotherapy may be started beforehand in order to strengthen the knee and reduce swelling. Sprained ankles are another common rugby injury and are caused by the stretching and/or tearing of ligaments. This is a painful condition requiring rest from play. Other symptoms are swelling, inflammation, difficulty walking and decrease in the elasticity of the ligament. A serious ankle sprain can be more painful and take a longer time to heal than a broken bone. The RICE formula is always helpful but once the pain and swelling subside the athlete should seek physiotherapy in order to promote flexibility and strength. To avoid running injuries, athletes should pay attention to the above factors as well as preparing their bodies to meet the physical challenges of running. Metatarsalgia manifests itself in pain and inflammation in the ball of the foot. Wearing shoes with soles that are too thin or inflexible can lead to this foot injury. Pain in the forefoot is most pronounced when the person tries to bear weight or push off. Rest and icing are helpful followed by physiotherapy for stretching and strengthening exercises. This is a common, painful condition experienced by runners. It is characterised by pain to the back of the heel which increases with exercise and decreases when the exercise stops. There is also difficulty walking or rising up on the toes. The best treatment for Achilles tendonitis is to rest and ice the injured foot until the pain goes away. Rehabilitation is necessary to toughen the tendon and stretch and strengthen the calf muscles. This is the thick sheath of connective tissue that runs from the hip bone (femur) down the outside of the thigh and attaches to the outside of the shin bone (tibia). It acts to extend (straighten) the leg and abduct the hip (move it sideways). As this band passes over the bony part on the outside of the knee, it causes friction which leads to pain. 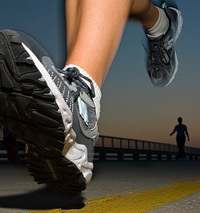 Iliotibial band syndrome is sometimes referred to as runner’s knee. Major symptoms are a burning sensation on the outside of the knee, or along the entire sheath and worsening pain when the foot strikes the ground. The athlete can rest and apply cold therapy to the knee to reduce pain. A rehabilitation program will prevent the rolling action during the stance phase which is responsible for the friction injury. 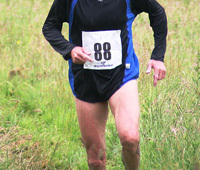 Minimising downhill running or eliminating it altogether can speed up recovery. This condition occurs at the front inside of the shin bone and results in pain at the start of exercise, fading away as the session progresses and returning when the activity ceases. Pain is usually felt when the toes or foot are bent downwards. There may also be lumps or bumps felt over the area. Treatment involves rest to allow the injury to heal. Icing and anti-inflammatory medications are also helpful. A physiotherapist will perform a gait analysis to determine if you over-pronate (sole of the foot turns outward) or over-supinate (sole turns inward). Both of these conditions cause problems for runners as the foot does not absorb shock during running. Faulty movement patterns or weaknesses at the hip and knee are frequently responsible for biomechanical problems at the foot/ankle. 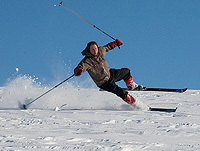 Skiing injuries are quite common, especially among occasional skiers. Most injuries occur as a result of falls; concussions, shoulder injuries and fractures being common as skiers lose control. Other common skiing injuries are ACL (anterior cruciate ligament) and thumb injuries. Many skiing injuries can be avoided by embarking on a conditioning program before you begin the season and by wearing protective gear. These may be mild or severe and may occur from a fall or direct blow to the head. A concussion occurs when the brain moves violently in the skull as a result of the trauma. Someone who sustains a mild concussion while skiing may appear disoriented, confused and may suffer memory loss. In severe cases there may be headaches, stiff neck, bleeding from the nose or ears, dizziness, blurred vision and even loss of consciousness. Any of these signs require immediate medical attention. Even mild cases should be reported as more severe effects could be felt later. Also known as gamekeepers’ thumb, this is a common skiing injury that causes pain and a premature end to a skiing trip. This injury takes place at the MCP (metacarpophalangeal) joint at the base of the thumb and involves the UCL (ulnar collateral ligament). This type of skiing injury usually occurs when a skier’s thumb is forced into abduction (movement away from the index finger) and hyperextension (moving backward) against the ski pole during a fall or other impact. For a simple strain or tear, icing and casting to immobilise the joint work best. However, if there is a complete tear, fracture or instability of the MCP joint, surgery may be necessary. Physiotherapy will follow to restore joint mobility, strength and stability. It is important to treat a thumb injury promptly; if neglected, it may become chronic and arthritis and instability will develop. Medial collateral ligament (MCL) injuries occur most commonly among beginning and immediate skiers due to faulty biomechanics. Knee pain, swelling and tenderness are the usual symptoms. This type of skiing injury responds well to conservative treatments with RICE (Rest, Ice, Compression and Elevation) and physiotherapy. However, in some instances, your doctor may decide to perform surgery. Most advanced skiers who become injured while skiing may suffer an anterior collateral injury (ACL) of the knee. This may occur in conjunction with a MCL injury and can be disabling. There may be an audible pop at the time of the injury, followed by knee pain, swelling and tenderness on the inner side of the knee. It may be difficult to walk or straighten the knee. With this type of knee injury, the athlete should stop the activity immediately and apply the RICE protocol. If you are not a high-powered athlete, your doctor may decide to operate and recommend physiotherapy before surgery to ensure the best results. A knee brace is often recommended for stability. For these or any type of skiing injury give us a call or pay us a visit. We are here to help. The game of squash is a high-impact, fast moving one that lends itself to a lot of injuries, some of which may be severe. Apart from the injuries that can occur from moving around the court, players also become injured from contact with the ball, their opponent’s racquet and even the wall. 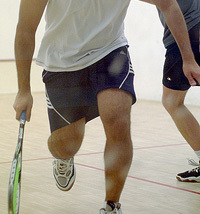 Players need to be very fit in order to avoid being injured while playing squash. Some of the most common squash injuries are muscle, tendon and ligament sprains and eye injuries. This is one of the most common squash injuries, that affects either the heel or the mid-point of the Achilles tendon just above the heel. It may be an acute injury or chronic and healing can be slow because of the poor blood supply to this portion of the leg. Symptoms are gradual onset of pain which starts with exercises and lessens as exercises progresses. Pain usually subsides with rest. Achilles tendonitis can become chronic if the athlete does not rest or seek help at first onset. Achilles tendonitis is an overuse injury that can be caused by increase in activity, less recovery between activities and exercising in flat shoes which puts stress on the tendon. The condition can be prevented by warming up thoroughly before play and stretching properly afterward. Wearing shoes that provide adequate cushion is also helpful. Proper rehabilitation is necessary if you sustain this type of squash injury in order to prevent from becoming chronic. The athlete should apply the RICE (Rest, Ice, Compression, Elevation) formula at the first sign of injury. These are another common squash injury and are caused by the stretching and/or tearing of ligaments. This is a painful condition requiring rest and rehabilitation. Other symptoms are swelling, inflammation, difficulty walking, decrease in the elasticity of the ligament. A serious ankle sprain can be more painful and take a longer time to heal than a broken bone. The RICE formula is always helpful but once the pain and swelling subside the athlete should seek physiotherapy in order to promote flexibility and strength. Squash injuries occur more among older players than younger ones. Lack of conditioning, experience playing the game and reduced reaction times may all contribute to injuries. By taking certain common sense precautions these injuries can be avoided. Players should be careful of their surroundings, wear proper footwear and protective eyewear, warm up and cool down thoroughly and maintain strength and flexibility. Finally, if you do become injured while playing squash, stop playing immediately and seek assistance. At Platinum Physiotherapy we can help you return to fitness if you have had suffered any type of squash injury. On the surface it would appear that swimming injuries are rare compared to that of other sports. After all, swimming is touted to be one of the best and safest forms of exercise. The fact is that injuries do occur among novices as well as competitive swimmers. The main areas that are injured while swimming are the shoulder and the knee. These injuries are generally known as swimmers shoulder and breast-stroke knee respectively. However, muscle cramps also occur as well as injuries of the back and neck. Swimmers perform a vast number of overhead arm movements during the course of their training. It follows therefore that the shoulders are subjected to tremendous stress and micro-traumas can result. These micro-traumas develop into a number of syndromes: rotator cuff tendonitis, biceps tendonitis and subacromial tendonitis. Overuse and instability are the main causes of swimmers shoulder followed by faulty mechanics, sudden increases in training load or intensity and the use of hand paddles. Symptoms of swimmers shoulder are deep shoulder pain felt at night or it may only be felt in a painful arc between the shoulder and the waist. If there is an impingement, pain may increase over time, as opposed to sudden pain if there is a tear. At the first sign of swimmers shoulder, an evaluation should be done by a physiotherapist so that rehabilitation can begin before the condition worsens. Rest and ice in the beginning are helpful.. Rehabilitation will initially focus on stretching exercises to improve joint mobility and isometric exercises (muscle contracts without movement) for strengthening. You should cease from overhead training and from using hand paddles. Knee injuries involving increased stress on the medial collateral ligament (that stabilises the knee), may occur in young as well as more experienced swimmers. The capsule and the patella (kneecap) can also be injured while swimming. Weak vastus medialis (the inner thigh muscle which is part of the quadriceps), poor mechanics and decreased hamstring flexibility can contribute to these swimming injuries. Rest and icing to reduce pain and inflammation, followed by physiotherapy will help you return to swimming. Muscle cramps while swimming can be fatal. They can be mild or painful and occur mostly in muscles that cross two joints, example the calf muscle. Cramps may occur as a result of poor conditioning, muscle fatigue, dehydration or performing a new activity. If a cramp occurs while swimming you should flip over on your back, raise the leg high and massage the location, while using one arm to paddle to the poolside/shore. The back, neck and upper spine can also become injured while swimming as a result of being over stretched during the breast stroke and from repetitive motions during the frontward strokes. To avoid back pain while swimming, you should examine your technique. Sudden, jerky movements can put strain on your neck and upper spine. Wearing a life vest or other flotation device can help you maintain proper form while swimming. If back injury does occur, you should rest from the activity, apply ice and seek physiotherapy treatment. Specially designed exercises to stretch and strengthen the muscles may be what you need. Do not hesitate to call us if you have any of these injuries. This is a common repetitive injury that leads to elbow pain, however it may also be caused by sudden impact. Symptoms are pain on the outside of the elbow which may radiate down the forearm. Lifting heavy objects may also cause elbow pain. The RICE (rest, ice, compression, elevation) method is helpful in relieving pain and inflammation. Physiotherapy is recommended for flexibility and strengthening so that you can return to playing tennis. This is a tennis injury that results from repeated overhead movements. This causes inflammation in the tendons of the rotator cuff muscles, leading to shoulder pain and weakness with overhead movements or pain at night, especially when lying on the affected shoulder. Rest and icing are the first forms of treatment followed by physiotherapy exercises for strengthening. In severe cases, surgery may be necessary. Inflammation of the tendons of the thumb may occur when someone starts playing tennis for the first time but it can also be an overuse injury. Injury to the arm, poor technique or improper equipment may also lead to this type of tennis injury. Wrist pain is felt in the front of the wrist and if you make a fist with the thumb inside, there would most likely be pain. Rest and icing should be employed to allow the inflammation to heal. Stretching and strengthening exercises will be helpful to allow you to return to tennis. A sprained wrist may occur from a fall on an outstretched hand. This causes stretching or tears to the ligaments of the wrist. Pain, tenderness and swelling over the wrist will be seen. If you experience these symptoms you should rest from the activity and apply ice. Once the symptoms have subsided you should contact your physiotherapist for a rehabilitation program. During a game, a tennis player is required to stop, start or make sudden changes in direction. This can result in stretching or tearing of the ligaments of the ankle leading to ankle sprain. Sometimes a loud “snap” or “pop” may be heard at the time of injury, followed by pain, swelling and tenderness over the site. Applying the RICE treatment should be your first course of action. Rest is needed to take the strain off the ankle and ice helps to relieve pain and inflammation. Compression of the ankle with a bandage and elevation of the foot while sitting and lying helps to reduce oedema or swelling. Physiotherapy will help with rehabilitation and your return to tennis in a short time. ACL injuries are quite common among tennis players for the reasons mentioned above. The ACL is one of the two major ligaments that help to stabilise the knee. When this is injured, knee stability is compromised, and knee pain, swelling and difficulty walking result. The first thing to do is use the RICE method, then seek out physiotherapy. 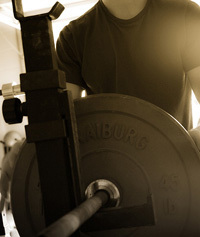 Weight training is a demanding activity that calls for concentration, commitment and overall health and fitness. It is not a high-impact sport like rugby or football, yet injuries can occur if a person is not careful. Rotator cuff injuries: Inflammation of the four muscles and tendons that stabilise the shoulder and help to move the arm. Shoulder pain, weakness and numbness are common. Rest, ice and anti-inflammatory medications are the first line of treatment followed by physiotherapy. Tennis elbow: This may arise from triceps exercise. Symptoms are pain on the outside of the elbow, weakness when attempting to lift, elbow pain when gripping or using the wrist. Treatment calls for rest from lifting, then physiotherapy for stretching and strengthening injuries. Thoracic outlet syndrome (TOS): The thoracic outlet is the area between the rib cage and collar bone. Compression of the subclavian artery and brachial plexus as they pass through a narrow space between the armpit and the arms leads to this syndrome. Symptoms include neck and shoulder pain, feeling of cold, numbness and tingling of the fingers and a weak grasp. Rest and physiotherapy are indicated to strengthen the shoulder muscles, improve range-of-motion and posture. If this is not successful, you may need surgery. Low back pain: Causes are improper form during lifting, weakness of the surrounding muscles and using too much weight. Rest and physiotherapy are vital to help the person return to weight-training. Improper stretching: Over-stretching of muscles, tendons and ligaments can lead to weight-training injuries. Proper stretching relaxes the muscles, increases flexibility and eliminates soreness. Inadequate warm up: Exercising on a cold, stiff muscle can lead to muscle strains and ligament sprains. To get the most out of your workout, warm-up with a few high-rep, low-intensity exercises first. Over-training: Sessions should be no more than an hour. Rest between sets and between workouts. Using weight that is too heavy adds up as over-training. Incorrect technique: This can tear or injure a muscle. Avoid twisting and turning while lifting and do not lock your joints. Cheating: Using momentum in order to handle heavy weight can cause you to drop the weight and injure yourself or someone else. Injuries suffered during weight-training can be far-reaching and complex. Please see us if you have suffered any type of weight-training injury. The most common yoga injuries occur as a result of repetitive strain on the wrists, shoulders, neck, knee, spine, hamstrings and the sacroiliac joint (which links the spinal column and the pelvis). The danger with yoga is that symptoms do not come on overnight and when they do appear it is usually too late. Also, beginners may try too hard and put a lot of strain on their joints. Pain, tenderness, difficulty with movements should alert that something is wrong and you should rest from the activity. See us or your doctor first if you have any chronic illness. Ask about any poses you should avoid. Find a qualified instructor. There are many books and tapes on the market and you may be tempted to learn from those, but you run the risk of performing the postures incorrectly and becoming injured. Drink plenty of fluids, especially if participating in Bikram or ‘hot’ Yoga. Set personal goals. As with any project you should have a goal in mind. Work toward that goal consistently without allowing yourself to be swayed by what you see others doing. Everyone is different.